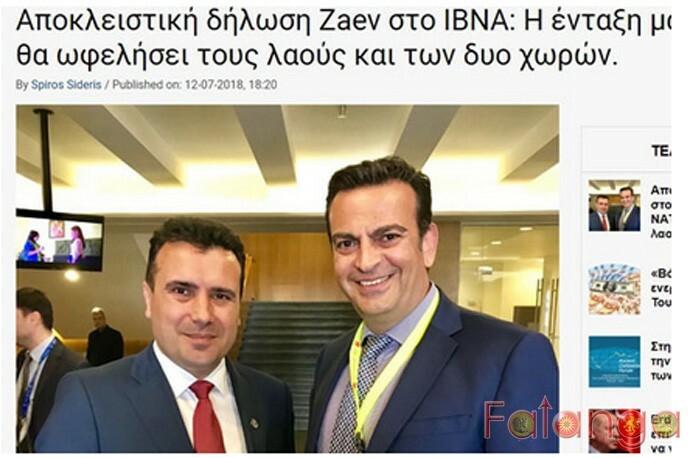 A few minutes after the signing of NATO's invitation by Secretary General Jens Stoltenberg to Macedonia to begin discussions for an Alliance membership, the Prime Minister of Macedonia Zoran Zaev, addressed the Greeks with an exclusive statement to IBNA..
Today I am an especially happy person because the agreement we have reached with Greece brought me and my country in the pleasant position to receive an invitation for full NATO membership. Accession to NATO will strengthen security and stability in the region and help increase investment across the region. I am convinced that with this development the results will be positive, both for the citizens of Greece and for the citizens of Macedonia. In this regard, I would like to point out once again the message and the importance of this agreement. The agreement creates friendship and cooperation, as well as prospects for the citizens of both countries. Believing firmly in this, I call on the citizens of Greece, as I call on the citizens of my own country, to make use of the agreement, which creates a better future for Greece and for Macedonia. Of course, at the end of the whole process, after the referendum and after the changes in the Constitution, we, as we have accepted, will be called North Macedonia. At the same time, as Greece accepted the terms Macedonian language and Macedonian people, we also accepted the term Greek Macedonians, with the particularities of their cultural heritage. I am convinced that the friendship we have built can yield, with mutual respect and mutual recognition, only positive results for today's generations and more importantly for the next generations".